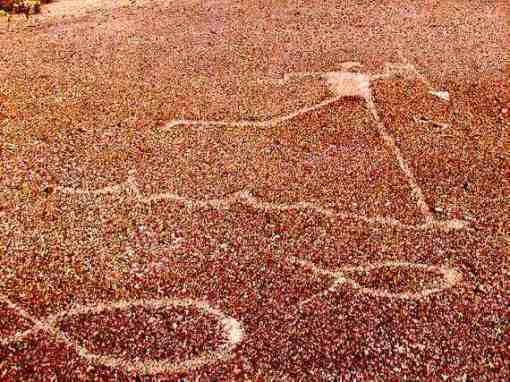 The “Fisherman” Geoglyph is a large earth figure near Quartize, Arizona. In ancient times, Native American people who were traveling through on the Indian Trail, stopped long enough to make a large intaglio image of a human figure, holding a large spear with a white quartz inlaid point. This figure is walking in or near water and is spearing fish. The legend states that Kumastamho made his way to the North, where he plunged his spear into the ground in search for water. Water surfaced on the first try, but ran North, away from the desert. He tried in each of the four directions, and finally, on the fourth try, Kumastamho was able to get the water to flow to the South-Southwest where it was needed. Kumastamho then took his great spear, with the very powerful quartz point, and made a path for the water to follow. When he came to rocky areas, he turned the spear on its edge, and wiggled it through the rocks to create what is now the Colorado River. Today, all of the Yuman-speaking tribes living along the Colorado River honor the Creator Kumastamho for the gift of water. So, which of the two accounts is true? The Native American people say they both are! The same picture tells two stories, each at a different level. Often Native American storytellers describe it this way, “ The sacred meaning is for the initiated Indian people, while the simpler, down to earth meaning is for the children and white people”. Above the head of the Fisherman are two images which were placed there to identify him as the Creator Kumastamho. To the upper right is the Sun, with a connecter bar to the head of Kumastamho., The Sun is a symbol associated with creation, and often the Sun and the Creator will share similar names. To the upper left is an image of the Sky Serpent. For years it was assumed that this image was a flying bird, but Native American sources shared that this is another primary symbol of the Creator. The Sky Serpent in Native American legend is also called the Feathered Serpent, or Quetzalcoatl in Mexico, and is a symbol of the Creator who descended from the Sky World to Earth, died there, and then was reborn and ascended back to the sky. Both of these symbols serve to identify the human figure as Kumastamho, the Creator.